The WEBphysiology Portfolio plugin was built to provide a clean, current look in situations where an expanded list-style or grid style portfolio layout is appropriate. The plugin is implemented via a [shortcode that supports specifying one-or-more portfolio types, all portfolio-types or all but specifically excluded portfolio types. This is the first publicly released plugin from WEBphysiology and can be downloaded here or on the WordPress Plugin site. 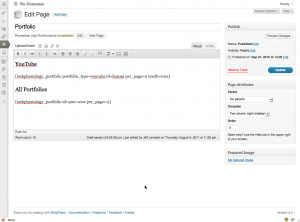 The WEBphysiology Portfolio WordPress plugin utilizes a Custom Post Type as well as a Custom Taxonomy (which requires WordPress 3.0 or better). It provides a Settings page for specifying a number of customizable options. It also allows one to tweak or turn off the provided CSS in place of implementing one’s own styling. 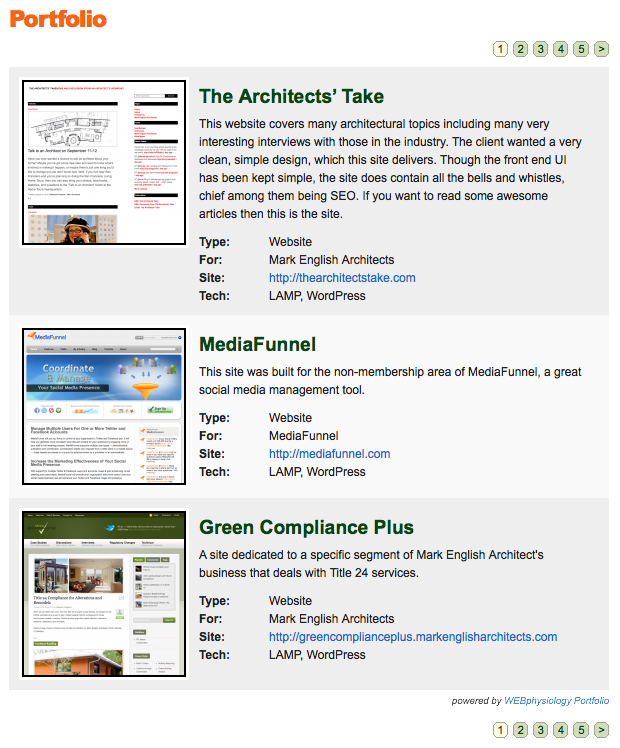 <href=”https://shrinktheweb.com” title=”Shrink The Web Generates Web Page Thumbnails”>ShrinkTheWeb.com to generate web page thumbnails. The end user interface can be adjusted using the available Option Settings in addition to your own CSS. It also incorporates the TimThumb.php code to custom scale the images displayed within the Portfolio. The benefit here is to decrease the page weight while maintaining an acceptable quality image, plus the fact that you only need to load one image for use in the list thumbnail and expanded view. The end user interface also utilizes FancyBox to present the full-sized image in a litebox/thickbox control or allows you the ability to direct the user to a different webpage when they click on a Portfolio image. To install the WEBphysiology Portfolio plugin simply download the ZIP file, extract it and place all of the files into the wp_contents/plugins directory of your WordPress site. Follow this by going to the Plugins admin area and activating the plugin. 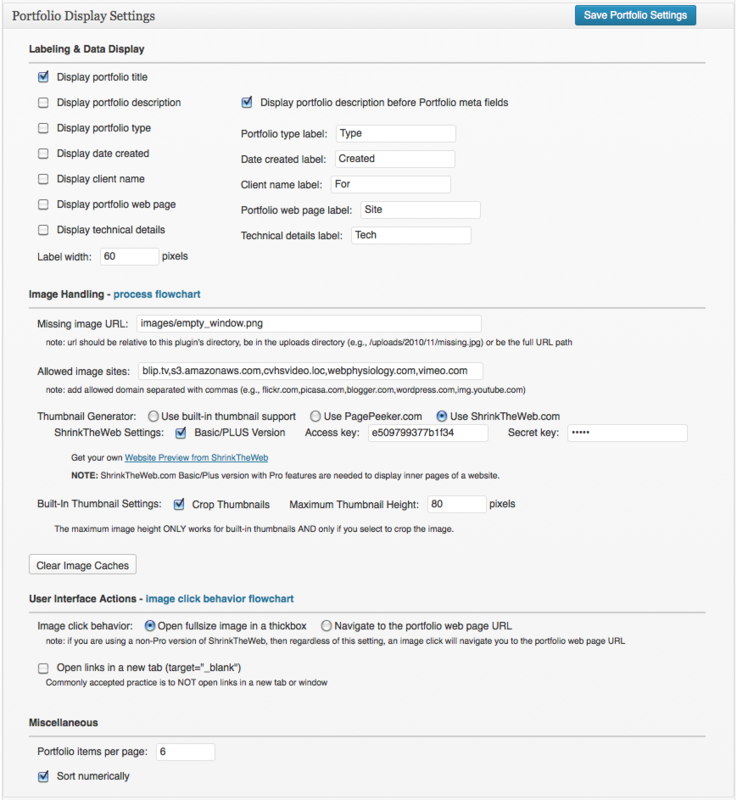 After activation a “Portfolio” options menu will appear under the “Settings” section of the WordPress administration area. You may adjust the options or leave them at their default values. Once activated, the WEBphysiology Portfolio plugin will create a new Portfolio menu section below the Posts section. Within the Portfolio menus one may edit or add a new Portfolio as well as manage Portfolio Types and Options. The WEBphysiology Portfolio is implemented utilizing a [shortcode]. There are a couple of options that may be specified with the shortcode to further control the display of the Portfolio on a given page. limit : This numeric parameter allows for the ability to limit the number of Portfolio items that are returned by the shortcode. This can be handy if you want to just show one or two portfolios of a certain type along with a link to a page with a full blown set of Portfolio records. Specifying just the Portfolio shortcode will result in all entered Portfolios being displayed. Specifying a single Portfolio Type parameter will result in a Portfolio listing that only contains Portfolios that have the specified Portfolio Type assigned. Important Note – make certain to specify the proper Portfolio Type slug value as WordPress may have altered what you had entered as the slug if it had already been used (e.g., as a Post Tag). For example, you may have entered “red” as your slug but WordPress may have appended a number, resulting in the slug actually being set to “red-1”. Specifying more than one Portfolio Type will result in a Portfolio listing that contains Portfolios that have the specified Portfolio Types assigned. Specifying a single Portfolio Type parameter with a dash before it will result in a Portfolio listing containing all Portfolios except for those with the specified Portfolio Type. You may mix and match any number of Portfolio Types to include or exclude. Those beginning with a dash will be excluded while all those without would be included. In this example, Portfolios with a type of red and blue would be included where white and yellow would be excluded. Specifying the max_nav_spread will affect the display of the navigation control. This control will exist anytime the number of Portfolios extends beyond the number that are displayed per page. The max_nav_spread option controls the width of this control. For example, if one were to specify 3, then the control, at it’s widest, would consist of 7 control buttons; first, previous, 1, 2, 3, next, last. The default behavior is an argument of 5. 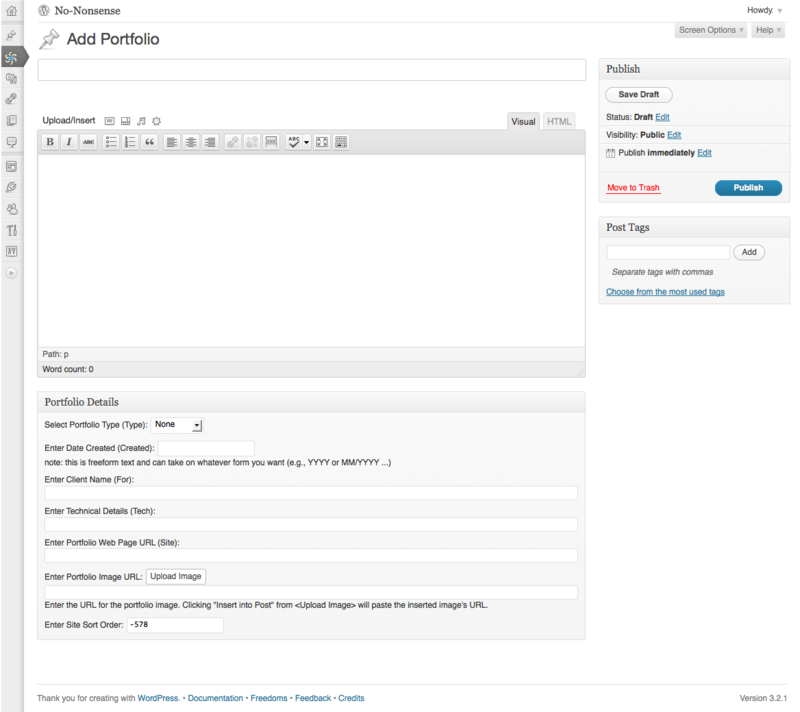 The Portfolio [shortcode] allows for the ability to enclose text between open/close shortcode tags. The result will be that the text enclosed between the opening and closing shortcode tags will be displayed above the Portfolio Listing. One also could simply place text before or after the [webphysiology_portfolio] shortcode. NOTE: If you include text between shortcode tags, you must do it for all [webphysiology_portfolio] shortcodes used on a given page. The one major thing to understand here, however, is that Portfolio navigation may break the look as the number of entries per page that you specify in the Portfolio options is tied directly to the use of a given shortcode. So, if you specify three items per page and you have one director, two screenwriters and five camermen, the results will be that page one lists all of the directors and screenwriters and the first three cameramen. Navigating to page two will show a “no records found error” for the directors and screenwriters and list the remaining two cameramen. Adding and editing Portfolio items is very easy as the form for this has been tailored to just display those items that need to be touched. Portfolio Title : Like a Post, this is the main title of the Portfolio item and should always be specified. Portfolio Description : This is the main block of text that provides details about the Portfolio item. It is the same control that you would use to enter the contents of a Post article. You typically would always enter a value for the Portfolio description. Portfolio Type : This field allows you to categorize your Portfolio items and acts much like a Post Category. The value entered here also may be used to control which Portfolio items are displayed within a Portfolio listing. Date Created : The create date may be any string (e.g., 2009 or June 2010). If not specified, the Create Date line will not be displayed on the Portfolio item. Client Name : If this Portfolio item is associated with a client, then this value may be supplied. If no value is entered, this data line will not be displayed with the Portfolio item. Technical Details : If any technical details are available for the Portfolio item, they may be specified here. If no value is entered, this data line will not be displayed with the Portfolio item. Portfolio Web Page URL : If a website or web page is associated with the Portfolio item, then specifying it will provide a link to that page. If no value is entered, this data line will not be displayed with the Portfolio item. If you specify one of these video formats, the thumbnail will be generated by the video service, so, you don’t have to add a thumbnail if you don’t wish to. Portfolio Image URL : This URL defines the image that is displayed to the left of the Portfolio details. If no image URL is specified, a “blank” image will be displayed, as such, a Portfolio item should always include an image. The two exceptions where a thumbnail is displayed without specifying an image would be in the case of you using PagePeeker or ShrinkTheWeb, or if you enter a valid, supported video format in the “Portfolio Web Page URL” field. The “upload image” button works like the standard image button on a Post. When you are in the details section of an uploaded image you may either copy the link URL and then paste it into this field or, if you use the Insert into Post link it will copy the URL into this field. Portfolio Sort Order : This field defines the order that Portfolio items will be displayed in the Portfolio listing. The field will default to a negative value of the Portfolio’s Post ID, such that if no changes are made, the most recent Portfolio items will be displayed at the top of the list. Portfolio List : The Portfolio List, like any post type in WordPress, may be searched to quickly find a particular Portfolio, should you have many. You also may click on the Sort Order or Type column headings to sort the list by these columns. 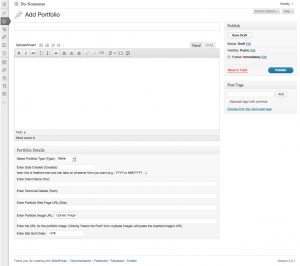 The management of Portfolio Types is handled in the same manner as Tags. In fact, the form used is pretty much the same other than the page title. There are quite a number of options available for managing the behavior of the user interface as well as the activation/deactivation of the Portfolio plugin. On occasion some upgrades to the WEBphysiology Portfolio plugin will contain changes that may affect your existing use of the plugin. When these occur, special release notes are created and added to the options page. You may, otherwise, always check the Change Log on this page or in the plugin’s readme.txt file for full release change details. WEBphysiology Portfolio provides the ability to control what the visitor sees in your portfolio. Beginning with version 1.1.0, the ability to hide detail elements in the front end has been added. Previously this only occurred when no data was populated for a given attribute. Now you can capture data elements but hide them from the display. In addition, labeling of the fields has been added and UI actions have been enhanced. The ability to adjust the labels is provided to further allow for the customization of your portfolio. The primary thing to keep in mind is the width that these labels can take up, so, you should strive to keep them short unless you adjust the CSS to format the labels and data differently. Display portfolio title : A Portfolio Title should be assigned to all of your portfolio entries as it quickly defines what the portfolio item is. You may, however, hide the title from the website UI, if it doesn’t fit your design, by unchecking this check box. Display portfolio description : A Portfolio Description is the content entered in the main text area of the Portfolio. It is the same as the content area for a Post or Page. If you’ve entered a description, but wish to hide it from the website UI, simply uncheck this check box. Display portfolio description before Portfolio meta fields : If you would like any entered Portfolio Description text to be displayed above the Portfolio Meta Data (default) then check this box. Otherwise, if you would like the Portfolio Description to be displayed after the Portfolio Details, uncheck this check box. Display portfolio type : A Portfolio Type should be assigned to all of your portfolio entries as it allows for controlling the data displayed on a given page. You may, however, hide this from the website UI by unchecking this check box. Portfolio type label : Allows you to specify the label to display in your portfolio for the Portfolio Type data. The default is “Type”. Display create date : If a create date has been added to a Portfolio, but you don’t want to display this in the Portfolio, then uncheck this check box. The default is to display the create date when it exists. Date created label : Allows you to specify the label to display in your portfolio for the Date Created data. The default is “Created”. Display client name : If a client name has been added to a Portfolio, but you don’t want to display this in the Portfolio, then uncheck this check box. The default is to display the client name when it exists. Client name label : Allows you to specify the label to display in your portfolio for the Client Name data. The default is “For”. Display portfolio web page : If a URL to the client’s website has been added to a Portfolio, but you don’t want to display this in the Portfolio, then uncheck this check box. The default is to display the site’s URL when it exists. Another benefit of this setting is when used in conjunction with the “Image Click Behavior” setting as you now can set this URL to anything, including a different page on your site, and have the action of clicking on the thumbnail navigate the user to the specified URL. Portfolio web page label : Allows you to specify the label to display in your portfolio for the Portfolio Web Page URL data. The default is “Site”. Display technical details : If technical details have been added to a Portfolio, but you don’t want to display them in the Portfolio, then uncheck this check box. The default is to display the technical details when they exists. Technical details label : Allows you to specify the label to display in your portfolio for the Technical Details data. The default is “Tech”. Label width : The width of the labels can be adjusted to accommodate changes to the labels themselves. The default width is 60 pixels. Only enter the numeric value for this setting. 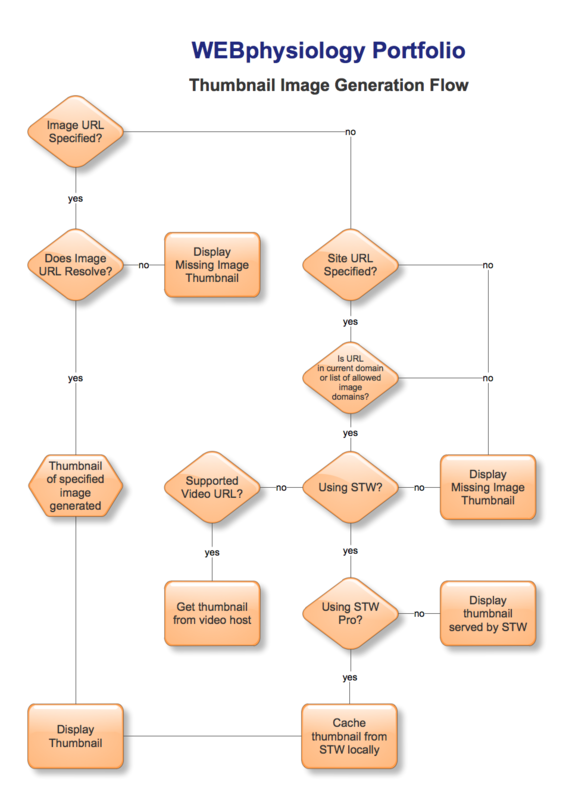 Refer to the Thumbnail Generation Flowchart to get a bird’s eye view of the flow around the creation of the thumbnails based upon the Option settings in combination with the Portfolio settings. Missing image URL : WEBphysiology Portfolio ships with an included image to place in your portfolio should you not have an image to associate with an entry. This image may not appeal to everyone, so, outside of stepping on it in the portfolio plugin directory, you now may specify the URL of your own, customized image. If this image is in the standard uploads directory you can specify the path beginning with the “/uploads/…” directory. Otherwise, specifying the complete URL path is recommended. Also note, if you keep the standard behavior of opening a litebox/thickbox, and you specify a custom image, the resulting behavior remains, that being that “missing images” do not open in the litebox, the thumbnail has no click action. However, if a Site URL has been specified, any missing image setting will result in the user being sent to the specified URL. Allowed image sites : This setting (released in v1.1.5) allows one to use a link to an image that is not on the local domain. Where this may come in most handy is when you are developing locally but want to have the images referenced coming off your live resources. The way this works on the back end is that images that are not on the local domain are copied to the “Temp” folder within the WEBphysiology plugin directory. That is, they are cached locally and created automatically, or re-created if they become deleted. To use this feature you simply need to ensure that the domain is specified in the comma-separated list of domains. If you forget to do this, an error will be displayed on the portfolio screen notifying you that images for “said” domain are not allowed to be displayed and the missing image will take its place. Thumbnail Generator : There are different methods for generating thumbnail images within your portfolio. Here is where you specify the method to utilize. Use built-in thumbnail support : The standard method for including a thumbnail in your portfolio is to upload an image, which will populate the Portfolio record’s “Portfolio Image URL” field. The resulting thumbnail will be scaled to the width defined in the styling section of this plugin. Use PagePeeker.com : A new feature added in version 1.4.0 is the ability to utilize PagePeeker.com to generate Website thumbnails. This service is easy to set up as it does not require an account unless you would like an unbranded thumbnail served up. If that is what you would like, then sign up for PagePeeker’s Custom Solution and enter your “Custom Account” code in the field provided. PagePeeker’s service does include inside pages as standard. Note, if you are serving up larger images within a litebox when a thumbnail is clicked, this does not work with PagePeeker. The result of a click will be to send the user to the URL used to generate the thumbnail. For portfolio records where you want to override having PagePeeker serve up a thumbnail, then just specify a Portfolio Image URL. Use ShrinkTheWeb.com : A new feature added in version 1.2.0 is the ability to utilize ShrinkTheWeb.com to generate Website thumbnails. You’ll need to set up an account with them and input your Access and Security key but then you can add new website portfolio items and not have to worry about taking screen shots. If you want the ability to display ShrinkTheWeb.com thumbnails in a thickbox, or specify inner website pages, you’ll need to subscribe to those services and, as necessary, check the Basic/PLUS Version checkbox. A Basic/Plus account will make for a more current view of the website as the thumbnails are updated periodically. This feature is used only if you have turned it on, you have assigned a website URL and you have not assigned a portfolio image URL. Handling things in this fashion allows you to specify an image in situations where you don’t want to utilize the one from ShrinkTheWeb.com but want others handled via that method. 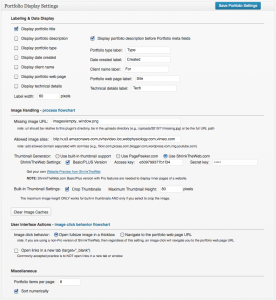 Built-In Thumbnail Settings : These options are utilized for thumbnail images that are generated by the WEBphysiology Portfolio plugin, as opposed to PageSeeker or ShrinkTheWeb. Even when using those services sometimes thumbnails are created by this plugin, for instance, when you specify an actual image on a Portfolio record to override the services thumbnail. Crop Thumbnails : If you are using image files to generate your thumbnails you can have these images cropped during the thumbnail creation. This will allow for some control over the final image size, though the cropped image will be the width you’ve specified for images in your portfolio and then proportioned. As such, if you want uniformity between the sizes of the images in your portfolio you’ll want to start with similarly sized full-sized images. Maximum Thumbnail Height : This setting only works when you specify to crop the thumbnails. It also only works with the built-in thumbnail generator, that is, it won’t work with PagePeeker or ShrinkTheWeb sourced thumbnails. Clear Image Caches : Clicking this button will remove cached image files located in the plugin’s temp directory, the ShrinkTheWeb cache directory and the TimThumb cache directory. 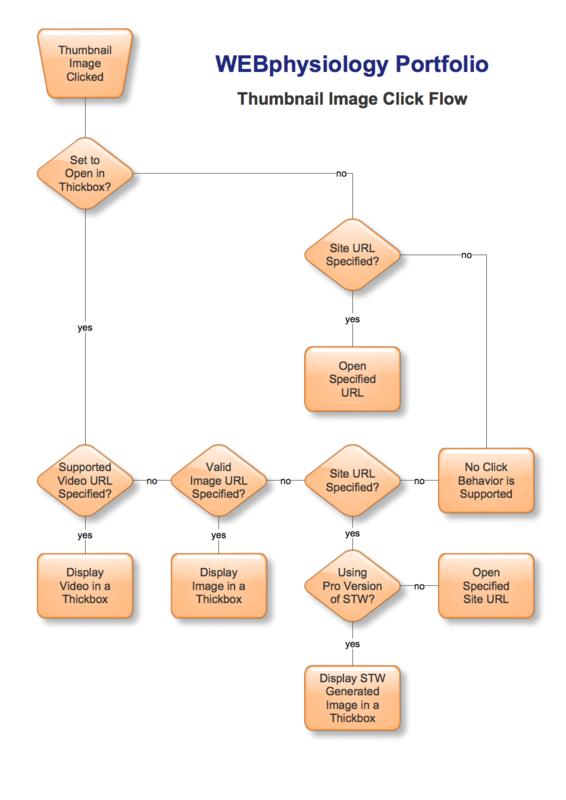 Refer to the Thumbnail Click Behavior Flowchart to get a bird’s eye view of the navigation flow after a thumbnail click based upon Option settings in combination with Portfolio settings. Image click behavior : The original release of WEBphysiology Portfolio limited the action taken when a thumbnail was clicked to popping the image corresponding to the thumbnail in a litebox/thickbox control. While this is likely the action that many folks will still utilize, you now may also change the behavior to have a click navigate the user to the URL specified in the Portfolio Web Page URL field. This URL could be the actual URL to the associated site or a URL on your own site that contains more details about the item. Open links in a new tab : While the accepted web design standard is to open links within the current tab/window, there is debate. To satisfy those that prescribe to a different standard this setting will allow you to have any links open a new tab/window. It essentially adds “target=’_blank'” to the anchor tag. Portfolio items per page : Defines how many Portfolio items (rows) are displayed on a given Portfolio page. The default is three. Sort numerically : The sort field on a Portfolio will, by default, be assigned the negative value of the Portfolio’s ID, which will make more recent Portfolios float to the top. You may re-number these to re-order the Portfolios. You also may put alphanumeric values in the sort field and uncheck this box to have portfolios sort alphabetically by these non-numeric values. This works great if you are using the Portfolio for biographies or the like. Use Portfolio plugin CSS : If you prefer to control the styling without having to fight the plugin’s styling, simply turn off the inclusion of the plugin’s CSS. When you turn off this option, the WEBphysiology Portfolio plugin stylesheet will no longer be referenced and the dynamically embedded style section also will no longer be included. As such, you should first duplicate the default styling and then adjust it as needed. Refer to the Custom CSS URL topic below as well as the last paragraph of this section. note: The “portfolios” ID will be deprecated in a later release. CSS for the class “webphysiology_portfolio” has been in version 1.1.6 to replace the ID CSS. Use Grid Style layout : If you prefer to place your images into a grid layout you may do so with this setting. On the back end the portfolio items are placed within an unordered list and floated. The styling will heavily depend upon your images being consistently sized and you may also need to tweak the CSS more than you would have using the standard list-styled layout. You’ll also need to play a bit with the “image width” setting to get the number of columns just right. Grid background color : If your grid ends up with an open cell or two on the end, this color will fill in that area. So, for example, if you have a 3 x 2 grid but only four portfolio items, the fifth and sixth cells will take on this background color. Setting it the same as the “odd” stripe background color seems to work well. Include mobile styling for @media only screen and (min-device-width: 320px) and (max-device-width: 480px) : If your theme is responsive, and you need to have the width of your portfolio narrowed up when on a smaller device, then selecting this option will add additional styling to the portfolio page that will use the “overall mobile width” setting. If this doesn’t work well enough, then you can review the page source for what was added, turn this off and add your own styling rules to your theme’s CSS file. 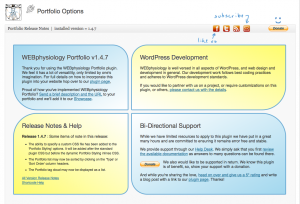 Use plugin’s single portfolio template if theme version does not exist : The WEBphysiology Portfolio plugin was not built with the intention of displaying individual portfolios on a single page. However, for situations where this may occur (e.g., search results) this plugin does support the creation of a template for such display. If a custom single Portfolio template has not been created then this plugin does include a template that may, or likely, may not match your theme but is available. This setting controls whether it is used or not. Portfolio List – overall width : This setting, specified in pixels, defines the full width of the Portfolio listing. The default is 660 pixels. overall mobile width : This setting, specified in pixels, defines the full width of the Portfolio listing when the device’s screen width is a minimum of 320px and a max of 480px. The default is 320 pixels. Portfolio List – image width : This setting will control the width of the Portfolio image. The image is constrained in a proportional manner, so, there is no need to define the height. The default width is 200 pixels. Note: This field will define the cell width when a grid formatted layout is utilized. 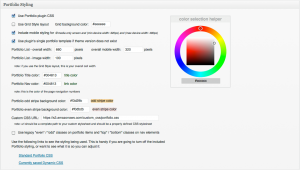 Color selection helper : This color picker has been included to make it easier to find the hex number for the color you would like to utilize on your Portfolio entry title’s, links and background coloring. Simply click on the circle to get into a color range and then use the center square to adjust the saturation. If you paste a hex value in the lower box you can start the process from a known color. When you have a color you want, simply copy the value from the field below the color picker and paste it into the appropriate styling area. Portfolio title color : This setting controls the color of the Portfolio item’s title. The default is #004813, which is a shade of green. Portfolio nav link color : This setting controls the color of the link elements within the navigation buttons. The default is #004813, which is a shade of green. Portfolio odd stripe background color : This setting controls the background color of odd Portfolio rows. Making the odd and even row colors identical will result in no visual separation between Portfolio items. The default is #eeeeee, which is a very light grey. Portfolio even stripe background color : This setting controls the background color of even numbered Portfolio rows. Making the odd and even row colors identical will result in no visual separation between Portfolio items. The default is #f5f5f5, which is an off white. Custom CSS URL : You have an option to specify a URL for a stylesheet that you want used in conjunction with this plugin. This stylesheet would be where you could override or augment the portfolio styling without having to adjust your theme’s stylesheet. The referenced URL should be a complete path to a CSS file. It will be referenced AFTER the plugin’s stylesheet, however, it is before the dynamic styling applied as a result of the “Portfolio Styling” section of the plugin options. You have two choices if this positioning causes a problem. The first is to use the “!important” rule to override the natural cascading precedence of a selector, which is generally discouraged. The other is to turn off the styling provided by the plugin and utilize just your custom stylesheet. If you take the second approach you can grab the styling from the portfolio’s styleseheet, along with the embedded plugin styling, and initialize your stylesheet with these. You’ll need to do this before turning off the plugin’s styling. See below for useful links to grab the plugin’s styling. Use legacy “even” / “odd” classes on portfolio items and “top” / “bottom” classes on nav elements : This setting supports earlier installations where styling was based on the noted classes. These classes have been replaced with more unique naming conventions to alleviate conflicts with theme’s that use the same classes and don’t target them specifically enough such that they were causing issues with the styling of the portfolio. New, and most current users of the WEBphysiology Portfolio plugin, should not check this option. At the bottom of the Portfolio Styling section are two links. The first, Standard Portfolio CSS, will display a pop-up of the plugin’s default styling. The second, Currently saved Dynamic CSS, will display the styling that will be embedded within the page source when the portfolio page is displayed. You can combine these two to generate the complete styling being applied to your portfolio. This may be helpful if you’d like to detour to using just your styling. See Custom CSS URL above for details on referencing your own custom stylesheet. Include Portfolio Tags in standard Tag Cloud widget : When checked, any Portfolio Tags will be included along with the standard Post tags. You may want to un-check this if you use the Portfolio Tag Cloud widget. Don’t register jQuery v1.7.1 from Google : Allows you to utilize the standard jQuery libraries that are included within the WordPress install. This option, however, should not be used unless issues are encountered with other plugins that also are trying to register the Google served jQuery libraries and causing issues. Don’t register Fancybox jQuery v1.3.4 : Allows you to turn off the registering of the Fancybox jQuery library. This has resolved some contentions with other plugins that also utilize this library or the thickbox PHP library. Some of these contentions were alleviated by coding changes in v1.4.0 of the WEBphysiology Portfolio plugin. Use full paths on images and css/js files : We have received support tickets from some users who use a hosting provider that does not allow full path names for the Portfolio Image URLs and others where the hosting provider requires it. By default, the WEBphysiology Portfolio plugin will use a relative path to the image but, if you are not seeing images displayed in your portfolio, then try turning on this option to force full path names to your images. Portfolio Permastruct Slug : Though this plugin was not specifically built to display individual portfolios on their own page, it can be accessed via searches or you may want to display it. 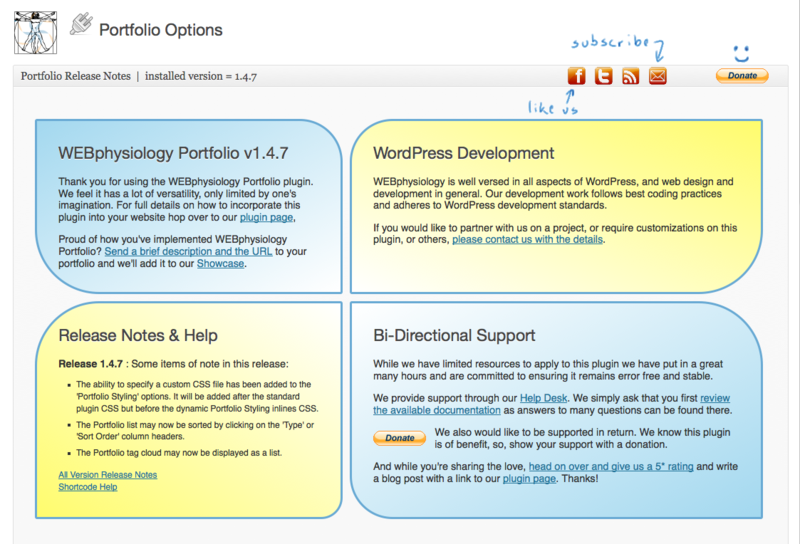 Should you work this into the mix you may change the custom post type slug from the default, webphys_portfolio. Just be certain that what you set this to is unique across all your post types, categories and tags or you will have conflicts. The default value was set to be pretty unique to avoid any conflicts. If you are changing from the default slug after having had this plugin installed for awhile, be aware that the individual Portfolio URLs will change, which could break links already pointing to the original URL. This, however, may not be a big deal. Only you can tell. If you have problems right after setting this try going to “Settings/Permalinks” and clicking the <Save Changes> button. Run in Debug Mode : On rare occasions it may be necessary to try and trace through the code as it builds out the portfolio page. In the past this debug output had to be turned on through the editor, now you can turn it on from within the Portfolio options. Note, this debug output will only be displayed for logged in Administrator level users. Display WEBphysiology credit : Will display a credit for your favorite plugin just below the lower right of the list in a very graceful manner. The default is to show your love. Delete Portfolio Option Settings : By default, inactivating the WEBphysiology Portfolio plugin will not delete the plugin’s option settings. It is recommended to only tick this checkbox if you will be deleting the plugin, or if you want to totally start from scratch. Using the can also be used to reset the plugin options. Delete Portfolio Records (includes Portfolio Types) : By default, inactivating the WEBphysiology Portfolio plugin will not delete the Portfolio data and Portfolio Types. It is recommended to only tick this checkbox if you will be deleting the plugin, or if you want to totally start from scratch. If you have templated your theme to display individual Portfolio records and want to include a Portfolio Tag Cloud, you can do so with the “Portfolio Tag Cloud” widget. There are two options available with this widget. The first is to specify a title for the widget area. The second is to override the default Tag Cloud behavior and display the tags in an evenly sized tag list. Specifying a ‘portfolio_type’ in the shortcode is not working. Why? Double-check that the code you are specifying is the correct Portfolio Type. For example, if you’ve used the same Portfolio Type as a Tag, chances are the slug on your portfolio type had a number appended, even though you didn’t type it in when you added it. Sometimes when you add the shortcode in the visual editor, especially if you copy and paste, it will apply formatting to the shortcode entry. If this happens then the plugin is unable to parse out the various components and WILL NOT WORK. The easiest way to see if this is happening is to flip to HTML editor mode and see if there are tags around any of the elements within the shortcode (e.g., <strong>, <em>, <code>). While in the HTML editor, remove any open and close formatting tags that are found or remove the formatting while in the Visual editor screen. Why aren’t my images displaying? This could be due to a variety of issues but the main ones tend to be an invalid image URL, permission issues on the caching directory or script contentions. If the missing image picture is displayed, the likely issue is a bad image URL. If a small black box is displayed, this may be a permission issue. The easiest way to check for this is to copy the source of the image and paste it into the browser address field. If this is a permission issue, an error message alluding to this situation will be displayed. My intention, at a minimum, is to maintain this plugin such that it is defect free. If after reviewing the details and videos here you still aren’t finding the answer you’re looking for, use our support system to log a ticket. The website URL I’ve specified is not being displayed as the ShrinkTheWeb.com generated thumbnail. Why? If you are specifying an inside page within your URL, then you must specifically subscribe to that service on your ShrinkTheWeb.com account. My thumbnail is not being displayed in a thickbox. Why? Don’t register Fancybox jQuery v1.3.4 – Try checking this option first and see if it resolves the issue. Don’t register jQuery v1.4.4 from Google – If turning off the registering of the Fancybox libraries doesn’t work, try disabling the registering of the Google served jQuery library. If this works you may want to see if you can un-tick the previous option as it is best to utilize these libraries for this plugin. I get a “File Not Found” error when I try and install from WordPress plugin area. Why? This happens on occasion. Running the install a second time typically results in a successful install. The styling of my Portfolio is not reflecting the changes I made in the Portfolio options. Why? The styling behavior of the WEBphysiology Portfolio can vary from theme to theme. The reason for this is that the theme’s styling can trump the Portfolio’s styling depending upon where the styling of one or the other falls within the styling hierarchy. If this is happening you’ll have to adjust your theme’s styling to allow for the portfolio’s styling to work or turn off the WEBphysiology Portfolio styling and hand it within your theme’s styling. ShrinkTheWeb.com behavior has changed. What’s going on? Part of the code change in version 1.4.6 of the WEBphysiology Portfolio plugin was to revert back the caching and linking of ShrinkTheWeb to pre-1.2.7 behavior. The behavior now is similar to the Plus version where the thumbnail image now is cached again and clicking will take you straight to the site, bypassing the middle confirmation page. 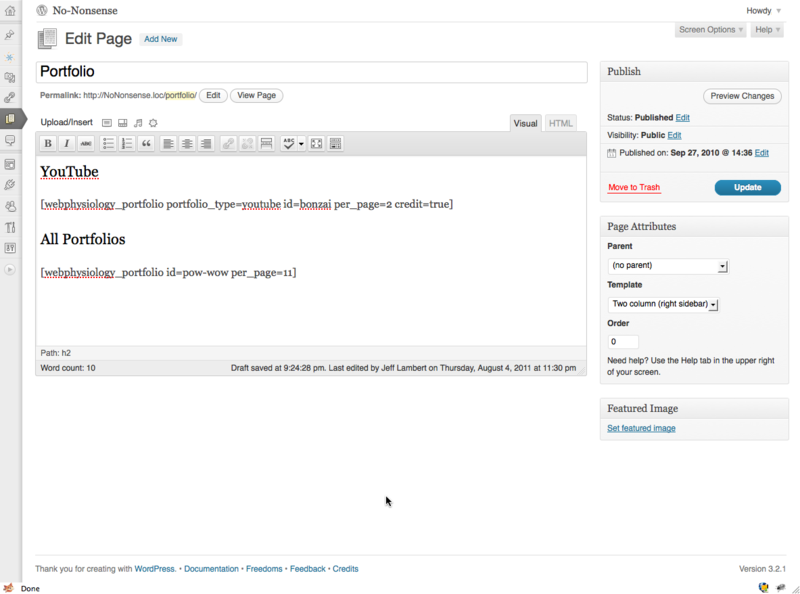 added the ability to specify a stylesheet that will be referenced after the WEBphysiology Portfolio plugin’s stylesheet. Note, this still is before the embedded styling if the plugin styling is being used. added links to generate a pop-up thickbox containing the styling from the plugin and plugin settings. Handy if you want to know what to adjust or what exists before turning off the plugin styling. ShrinkTheWeb has changed their service such that free accounts can now use the process that allows for local caching instead of having to use stw_pagepix. This is how it use to be, so, updated code to all work like ShrinkTheWeb pro with regard to not using stw_pagepix and, instead, caching images locally. added the ability to reduce the portfolio width for mobile devices. currently basic implementation and is off by default. removed un-used conditionally_add_scripts_and_styles function as there was another plugin, my-record-collection, that also had this function defined. better isolated navigation controls by adding “webphysport_nav_top” and “webphysport_nav_bottom” classes. top and bottom classes will be deprecated in a later release. added embedded portfolio CSS for new webphysport_odd_stripe and webphysport_even_stripe classes. odd and even classes will be deprecated in a later release. support for deeper page screenshot generation added for ShrinkTheWeb.com. This does require more than the basic subscription with them. NOTE: The “portfolios” ID will be deprecated from all CSS in a later release. CSS for the class “webphysiology_portfolio” has been in version 1.2.0 to replace the ID CSS. removed the forcing of the sort field to be numeric and added an option to sort alphabetically (by turning off “sort numerically”). Added apply_filters() to data retrieved with get_the_content() as that method does not include this, unlike the standard the_content() method. This was preventing the use of shortcodes within the Portfolio description. Bug fix – a form tag around the color selector was keeping the Portfolio Settings submit button from firing on Windows machines. !!! PLEASE NOTE A FEW CLASS STYLE CHANGES THAT YOU NEED TO BE AWARE OF AS SOME DEPRECATION WILL BE COMING SOON !!! As it would appear that many themes define a “top” and “bottom” classes, and because the top and bottom navigation buttons in this plugin also have these classes defined, we’ve added new classes, “webphysport_nav_top” and “webphysport_nav_bottom”, and updated our styling around these. The previous styling and inclusion of the “top” and “bottom” classes still remain, for backward compatibility, but WILL BE DEPRECATED in a future release. So, if you’ve created any CSS around the “top” or “bottom” classes specifically for this plugin, you should change them to use the “webphysport_nav_top” and “webphysport_nav_bottom” classes, respectively. As it would appear that many themes define a “odd” and “even” classes, and because the odd and even background striping in this plugin also have these classes defined, we’ve added new classes, “webphysport_odd_stripe” and “webphysport_odd_stripe”, and updated our styling around these. The previous styling and inclusion of the “odd” and “even” classes still remain, for backward compatibility, but WILL BE DEPRECATED in a future release. So, if you’ve created any CSS around the “odd” or “even” classes specifically for this plugin, you should change them to use the “webphysport_odd_stripe” and “webphysport_odd_stripe” classes, respectively. Due to a security issue with the TimThumb image resizing (PHP) plugin utilized in this WordPress plugin, this release was pushed out quickly on the heals of the v1.3.0 release. This release incorporates TimThumb 2.0. The default “Allowed Image Sites” have been stripped for security purposes. This means if you host any of your portfolio images on flickr.com, picasa.com, blogger.com, wordpress.com or img.youtube.com, you likely will need to add them back into the “Allowed Image Sites” field in Portfolio Options. You only should list those domains where you actually host images. !!! PLEASE NOTE – YOU NEED TO BE AWARE OF A SHORTCODE CHANGE !!! The support for the [Portfolio] shortcode has been removed in this release. The only supported shortcode for this plugin is [webphysiology_portfolio]. !!! 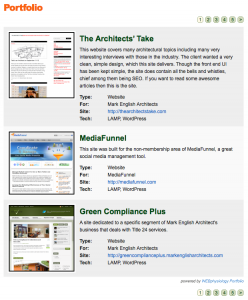 PLEASE NOTE SOME DEPRECATION HAS OCCURRED AND ShrinkTheWeb.com OFFERINGS HAVE CHANGED !!! The “#portfolios” <div> ID wrapper has been removed from the stylesheet as it was replaced several versions back with the <div> “.webphysiology_portfolio” class. ShrinkTheWeb.com has changed their model for non-paying customers to not allow for local caching of thumbnails they generate. This also results in not being able to display these images in a thickbox. 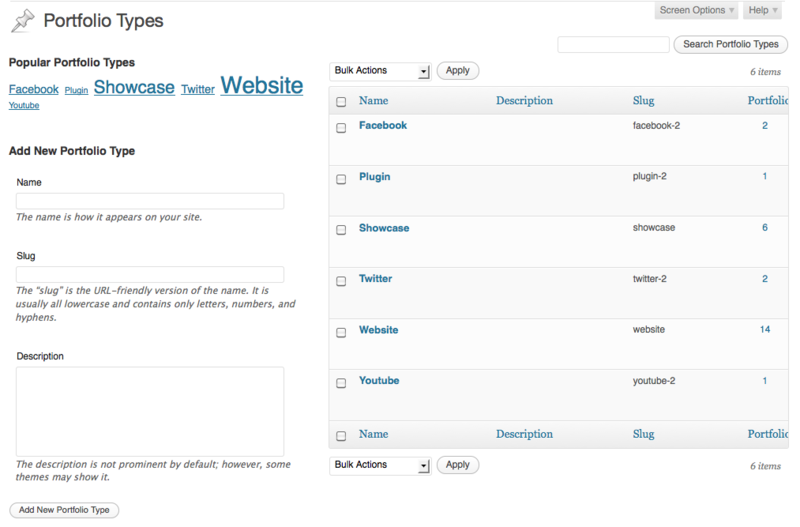 Non-Pro accounts also will generate a STW Preview Verification middle page when navigating to the underlying website. If you would like these features re-instated you will need to upgrade to a paid Pro level account. This also would give you the ability to generate website thumbnails for inner pages. Lock to Account Enforcement also has been added. Added Option settings to allow for not registering the Google served jQuery library or the more current Fancybox script. This is to assist in dealing with contentions with other plugins that register these scripts. The [portfolio] shortcode will be deprecated in the near future. The shortcode that should be used is [webphysiology_portfolio]. !!! PLEASE NOTE A FEW CHANGES THAT YOU NEED TO BE AWARE OF AS SOME DEPRECATION WILL BE COMING SOON !!! 1) To proactively try and avoid future plugin contentions, the shortcode will be changing from [portfolio] to [webphysiology_portfolio]. The later is currently available. The former will go away in the near future, so, update your portfolio pages with the new code. 2) If you are doing custom CSS work on the portfolio, be aware that back in version 1.2.0 we noted that the standard CSS that comes with the plugin was having the ID “#portfolio” selector changed to the class “.webphysiology_portfolio” selector. The ID selector will be removed from the CSS in the next release. You will not be affected if you have not customized any backend CSS. If you have, just make certain you are not using “#portfolio”. 3) The WEBphysiology Portfolio settings have been moved out from under the Admin “Settings” menu and relabeled. The plugin configuration options are now labeled “Options” and are located under the Portfolio menu block. 1) The custom post type has been changed from “Portfolio” to “webphys_portfolio”. Reason #1 is that WP v3.1 has disallowed the use of uppercase characters in the custom post type name, which broke the plugin. “webphys_” also was added to proactively try and avoid any contentions with other plugins and code. When you upgraded to v1.2.4 of this plugin the Portfolio Post data was automagically updated to the new custom post type value “webphys_portfolio”. id : this string parameter allows you to specify a <div> ID that will wrap the data returned by the shortcode. This will provide the ability to style a given instance of the shortcode differently from another instance. per_page : this numeric parameter, if specified, will override the Option setting and allow you to, on a particular instance of the shortcode, specify how many portfolio items will be included per page for that instance of the shortcode. credit : this boolean (true/false) parameter will let you override the Option setting, allowing you to only display the plugin credit where you want to. specific reason for this parm is to allow you, in instances where you have more than one [webphysiology_portfolio] shortcode on a page, to just display the credit on one instance. For a complete list of changes refer to the Readme.txt file in the WEBphysiology Portfolio plugin directory. 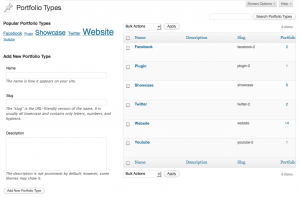 this plugin is great and we would like to use it on our site. However, there is 1 thing that bugs us: each time you click on a new item it reloads the whole window so that the background flashes white. Do you have any ideas how to get rid of the white flash? Thank you very much. This helped. I will get a support ticket if we run into anything else. Hi Jeff. Thank you for your plug-in! Thanks for your video tutorial for it as well. I’m sorry to say, I still can’t get it to work. When I view my portfolio page all I see is a grey box. I tried some of the tips on the timthumb trouble shooting page but I’m at a loss! Outside of this you’d just need to make certain that you’ve also created the Portfolio records and associated them with a Portfolio type. If you still are having problems please open a support ticket through the support sidebar tab on our website. I have been trying to activate the plugin but I keep getting the following error? Are you able to help. This only happens when I try to load this Plugin and I have had no trouble with others? p.s. If I end up using your plugin I will donate. Hello, is there a thumbnail/latest portfolio widget for the sidebar? No, the only related widget is the Portfolio Tag Cloud widget. This plugin looks great, and when I preview the portfolio that I’ve set up, it also looks great. But when the page actually loads, it’s all wonky. The pictures come out much larger and everything is offset. I noticed that you mentioned this is likely due to the theme code, but I’m not sure what to change to allow for the portfolio to come through looking like the preview. I’d appreciate any help. Thank you. – Copy the “single-webphys_portfolio.php” file from the plugin folder to your theme folder and then make PHP and/or styling changes to it. The first option would require CSS skills. The second option would require PHP and possibly CSS skills.